The spacious apartment Castellana Nobile lies in the Castello La Montecchia, a building dating back to the middle ages and entirely restructured in the 1930'ies. Strategically set on the top of a small hill, the castello overlooks the surrounding countryside and appears impressive and detached from the daily activities of the wine estate La Montecchia. Castellana Nobile occupies an entire wing of the Montecchia Castle. The rooms of Castellana Nobile have been restored recently and furnished to the highest standards. You will be staying in a real castle, with walls 1 meter thick. The apartment is set on three levels : On the ground floor is the old vaulted kitchen, which has been turned into a pleasant room with large dining table and door leading outside onto a terrace with table and chairs for outdoor meals. 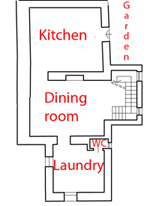 The ground floor also comprises a guest WC and a service room with laundry. Up the first flight of stairs you will find a cosy sitting and a large living room, a double bedroom and a bathroom. The 2nd floor comprises four bedrooms and three bathrooms. The spacious outdoor pool (ideal for laps) at the adjoining golf club is open from the beginning of June to the end of August. Guests of La Montecchia can use the pool at a reduced rate, the pool is closed with bad weather. Additionally, guests may enjoy a private organically shaped lake pool on the estate, surrounded by comfortable sunbeds. Smaller children can have fun in a small above ground pool in a separate area of the garden which is equipped with sun beds shaded by magnolia trees. The children pool is shared with all guests on the estate. The pools on the estate are open from beginning of May to end of September. Private terrace with table and chairs for outdoor dining. Olympic sized pool (25x10m) in adjacent golf club (5 min walk) at a reduced rate. Private organically shaped lake pool (18m long and 1,50 deep) in the garden of the estate. Shared above ground pool (4,5 m) for small children in the garden of the estate. Es war ein rundum wunderbarer Urlaub. Vielen Dank!